I was able to get a new computer and camera, thanks to Best Buy’s wonderful 18 month no interest financing, so I am ready to roll! For those curious, I ended up with an HP Pavilion g4 laptop, and a Canon PowerShot ELPH 300 HS camera. They’re pretty sweet. Although I definitely missed the blog, and found myself constantly wishing I could use the things going on in my life as blog material, it was nice to have a little break from it all. I ended up doing a lot of extra reading during the time that I usually spend blogging, and was finally able to finish reading The Omnivore’s Dilemma by Michael Pollan. Great read, by the way. Another exciting announcement from the Lindsay Loves Veggies crew is that my boyfriend, Keenan, just landed a full-time job as a line cook at Bremerton Bar and Grill! We’ve been living on one income since the end of last year, so this is a huge deal for us. It’s crazy, he had been desperately looking for months to no avail, then all of a sudden one day he got three calls for interviews in one day! It totally blew our minds. 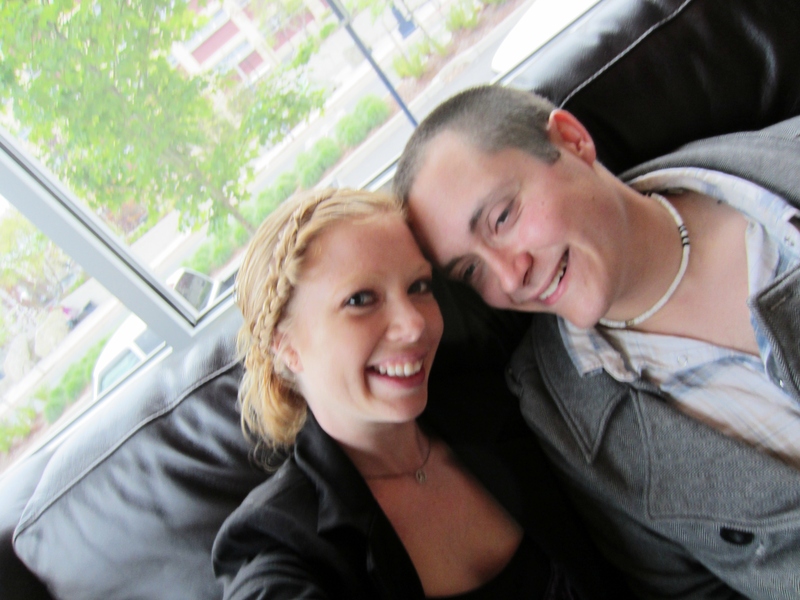 He was offered a job at Bremerton Bar and Grill a few days later, which was definitely our number one pick of the places that called him, and just a few blocks from our apartment. Life has wonderful ways of working itself out sometimes! Today was my first day home by myself while Keenan was at work, and I didn’t really know what to do with myself. I cleaned up the apartment a bit. Arlo and I ran to Fred Meyer and did a bit of grocery shopping. 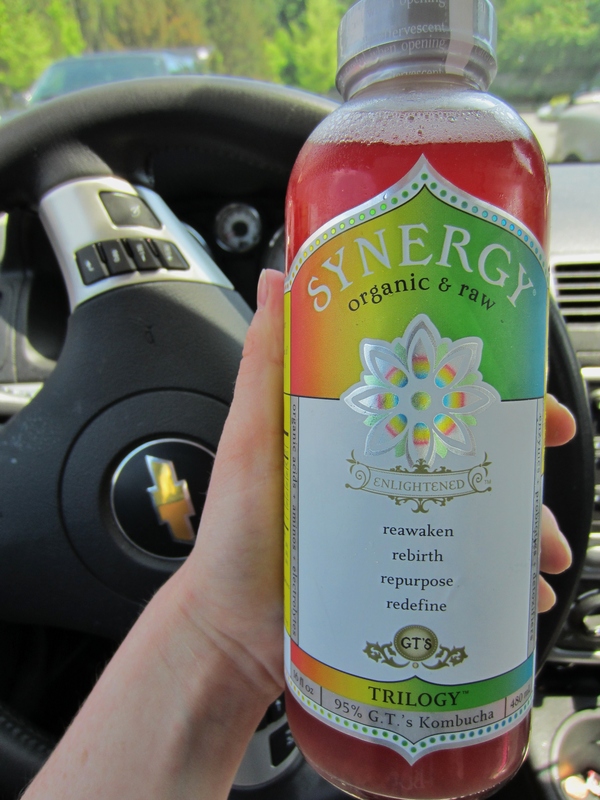 I treated myself to a kombucha. 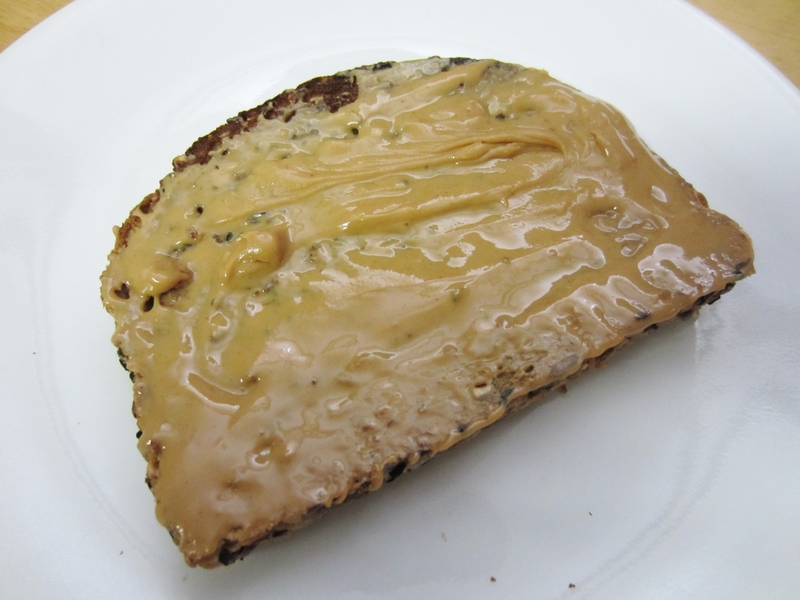 After shopping, I came home and had a quick snack of peanut butter toast, before getting my workout on. I’m trying to somewhat follow the Summer Shape-Up plan over at The Fitnessista, so I did the strength training workout that she has listed. 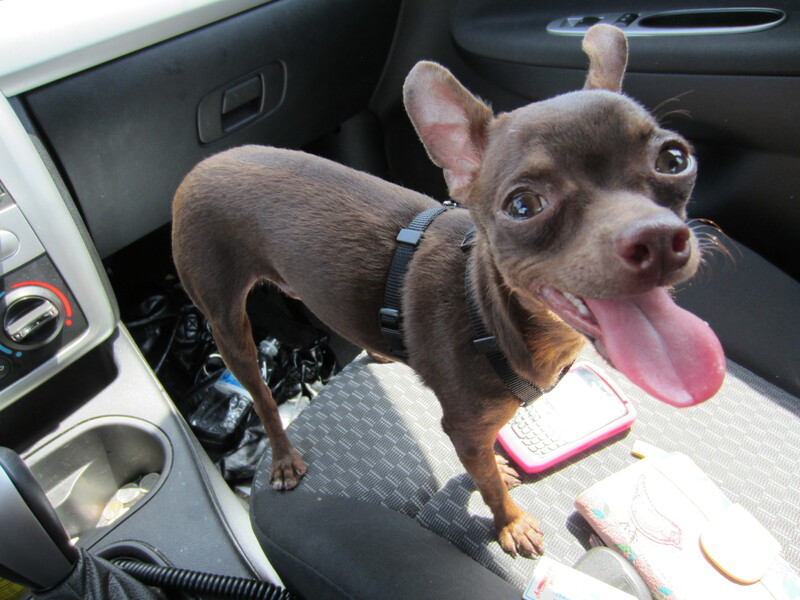 As I was finishing up, Keenan came home from work and we decided to take a run. 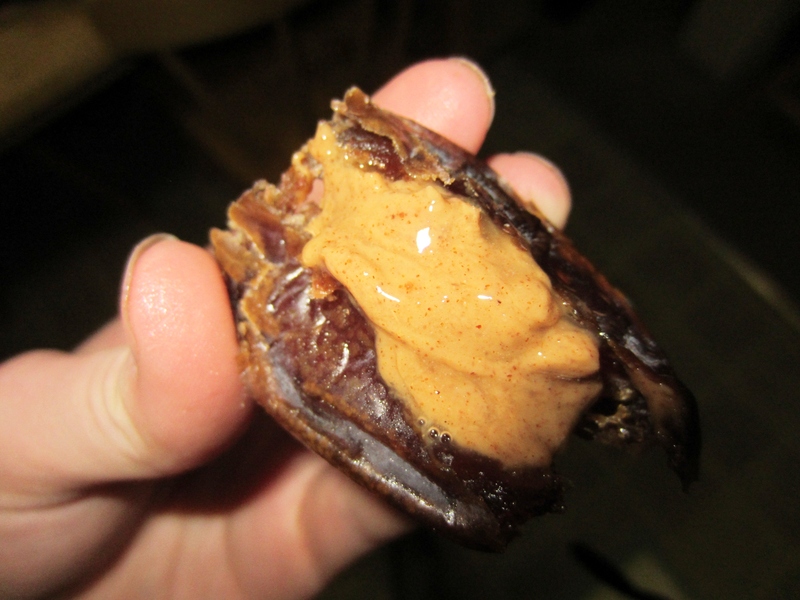 I quickly ate a couple dates, including one stuffed with almond butter for a bit of fuel. We ran the loop around the bridges by our house, about 2.5 miles, and ended up in the park and walked through farmers’ market. We didn’t have any money with us, so it was just a window shopping visit, but I always enjoy seeing the fun stuff that they have for sale. Pretty much the only veggies they had were greens though. The really good farming is at least an hour from here. After our run, I quickly showered and got ready to go out to dinner. In celebration of Keenan’s first day we decided to go back to the restaurant to enjoy a nice dinner (with a nice discount!). We started out with an appetizer and drinks. This hummus platter was amazing. It came with feta cheese, but I left that for Keenan to munch on. 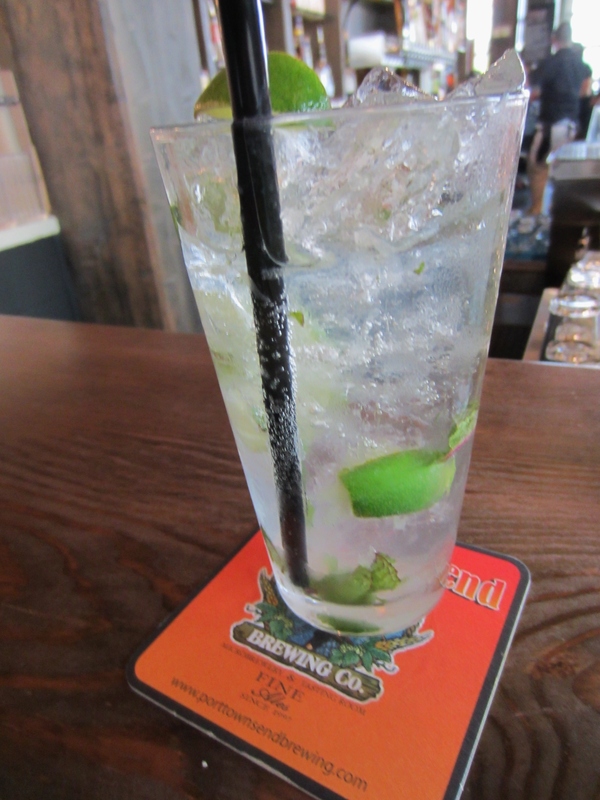 Usually I would have gone with a beer, but the Malibu Mojitos caught my eye, so I decided to get the Passionfruit Mojito. It was just club soda, passionfruit Malibu rum, ice, lime, and mint, but it was incredible. Not too sweet, and not too boozy. I had two of these babies over the course of a couple hours and I never felt them at all. Now I want to try the mango flavor too. 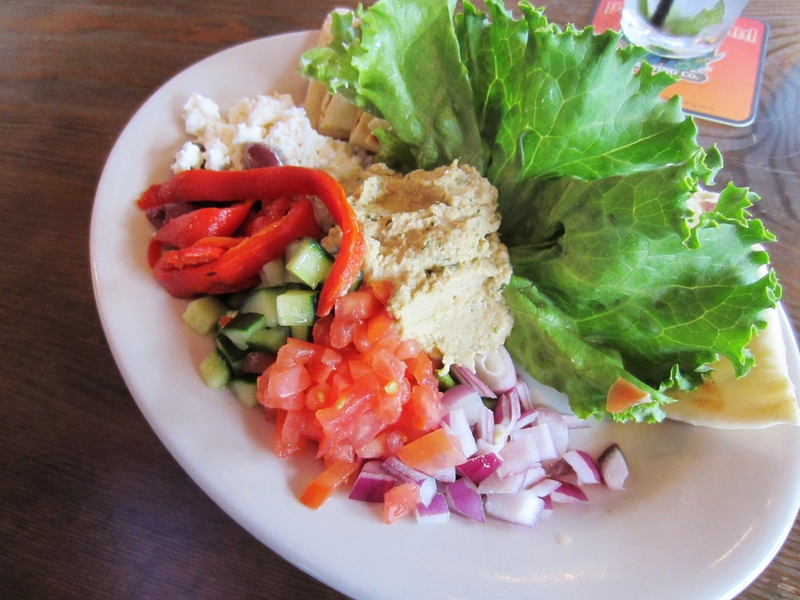 Just before I finished with my hummus platter, the waiter brought my salad. 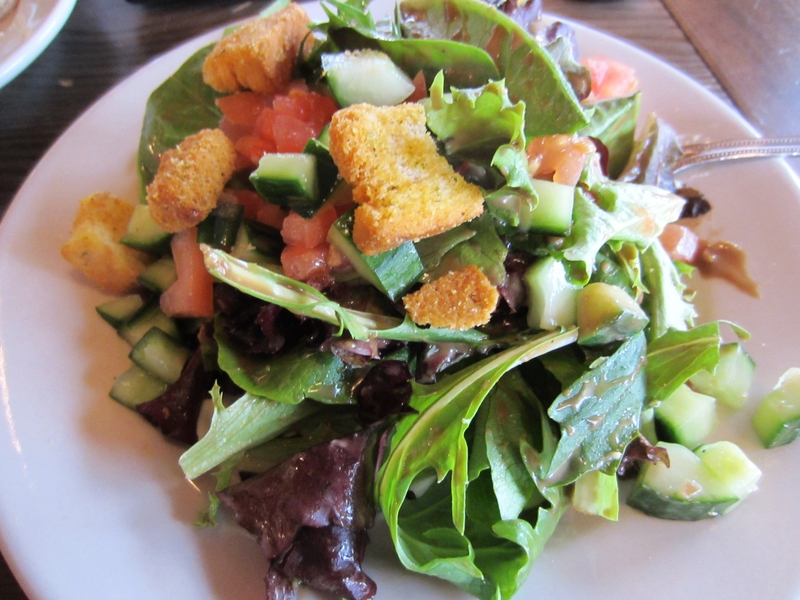 This is definitely the best vegan house salad I have ever had. The dressing was a honey balsamic that made my taste buds dance a little bit. My entree was really to die for though. They call it the Treehugger burger. 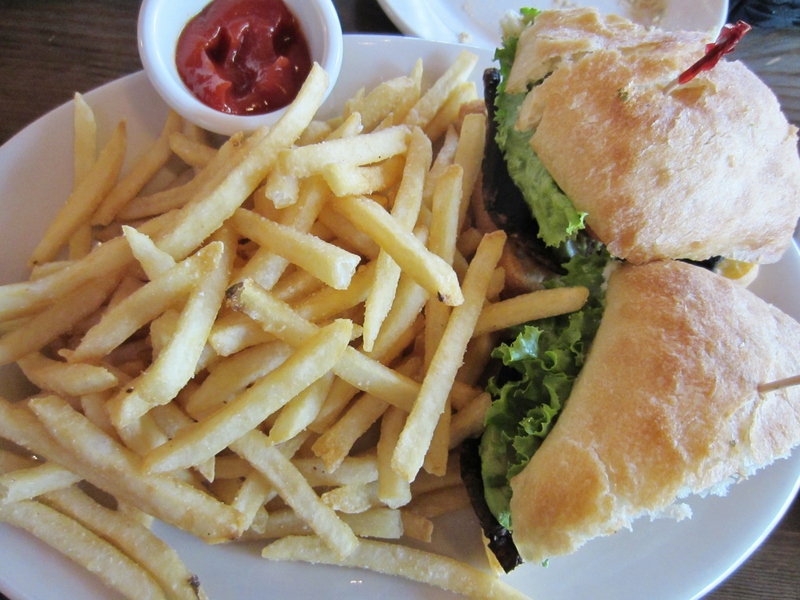 I ordered it without cheese and with a portobello instead of a patty. 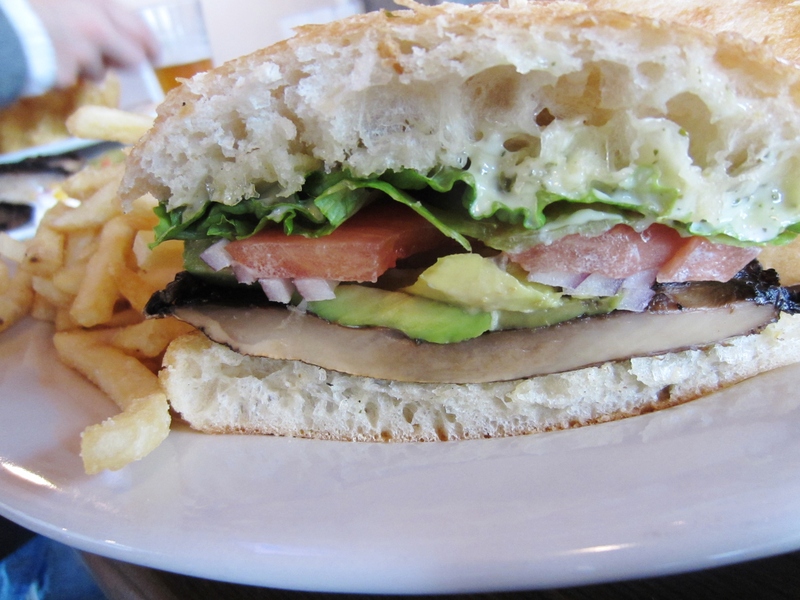 On a ciabatta bun, tomato, avocado, red onion, romaine lettuce and the portobello. I am so, so impressed. By the quality of this restaurant. Everything was impeccably done, and I really appreciated that they had options for both Gardenburgers or portobello in place of a regular burger patty. I’m really proud that my boyfriend is going to be one of the people preparing this delicious food. We really had a lovely night out together (Keenan just hates cameras, thus the face). And even though my basketball team lost tonight (Next one’s yours, Heat! ), Lebron still got a triple double, and I can be a gracious loser. I’ve got to run away for the night. I have got a pukey puppy. I think it has something to do with him licking the bottom of Keenan’s work shoes for about 5 hours straight this evening. Ew.